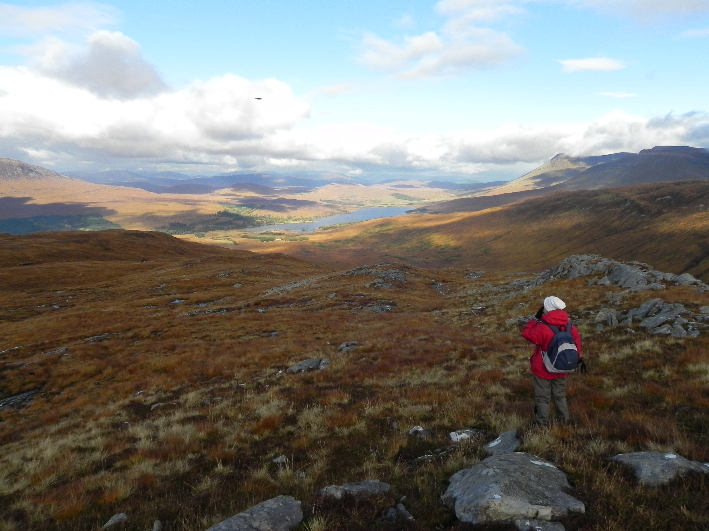 Another outing with Glasgow HF, and a chance to complete the walk I started last year to Meall Tairbh via Ben Inverveigh. On my last visit I had cut the walk short, partly due to a lack of time, partly because of rotten weather. As we drove up Loch Lomondside it looked as though the rotten weather had been awaiting my return, the rain beating on the windscreen and cloud hanging on the hills like painters dust sheets. I was leading this walk today, and had been joined by a new member, Andrew, and an existing club member, Elva. A small party, no doubt smaller than usual due to the weather. Had I not been leading I’ve have switched the alarm off and gone back to sleep myself. By the time we reached Tyndrum we could actually see the lower slopes of the hills, and by the time we had arrived at Inveroran the sky was bright blue, but the wind was bitterly cold. I had intended to start and finish at Bridge of Orchy, mainly because that’s where I’d walked from before. It was only on the train that morning I realised that we could actually start from Inveroran instead, as I would be in a car, not a train. Sometimes the blinding obvious isn’t. 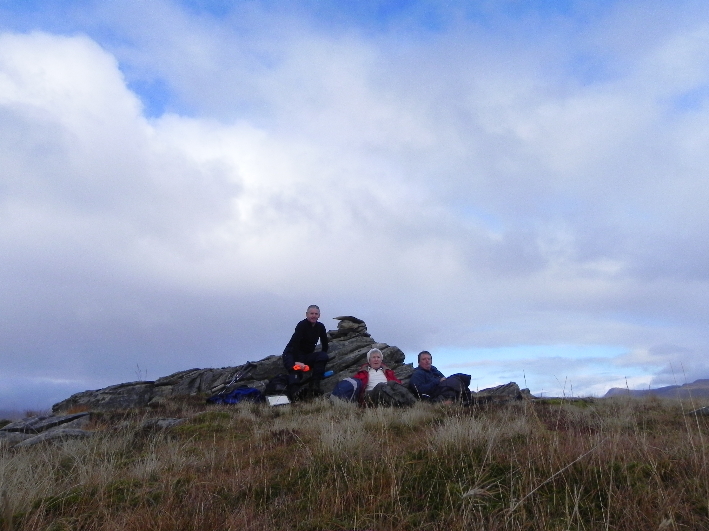 We left the car at Inveroran and climbed up to Màm Carraigh, where we met the Bearsden Ramblers, and one of their members who is also an HF member. Last October I met the same person with the same group on Ben Ledi. 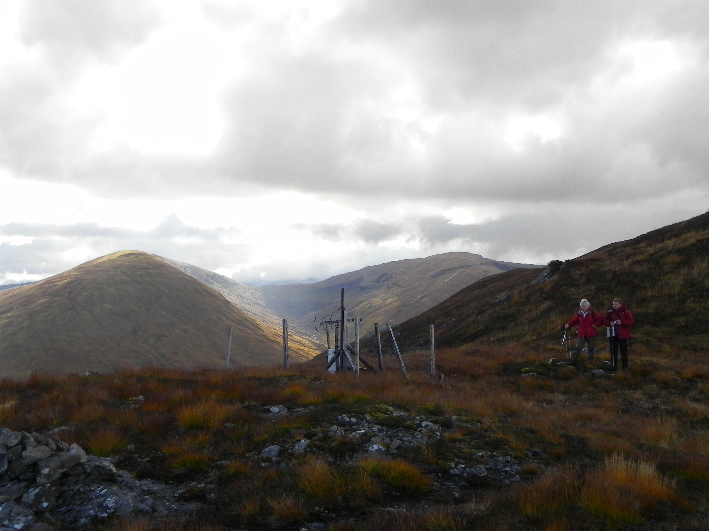 Hillwalking at times seems to be a very small community. 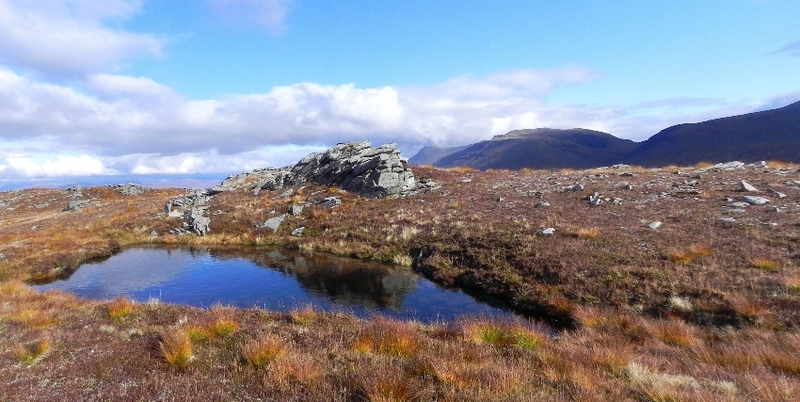 From Màm Carraigh a smaller path diverges, heading uphill to spot height 546, home to a couple of TV aerials, and a great place to take in the view of Beinn an Dòthaidh and Beinn Dorain. The path peters out after this, the ground rough and uneven with rocky outcrops scattered around, passing random pools of water before rising to the top, and it’s cairn strangely placed just off the highest point. We dropped down out of the wind and into another world, as the sun beat down on us, and we could take our jackets off without fear of freezing. 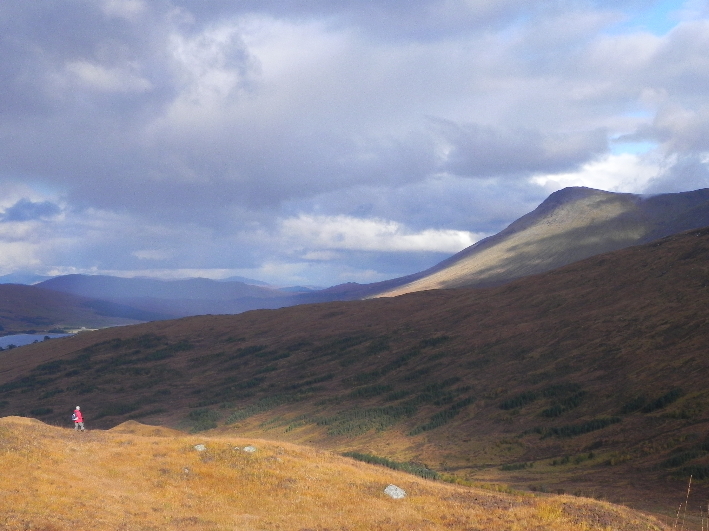 Across Glen Orchy the sun broke through the clouds.dappling Beinn Bhreac-liath and Beinn Udlaidh, and we could hear the noise of stags floating up from the glen. On my last visit there had been a few deer up here and I hoped we’d get to see some more today. 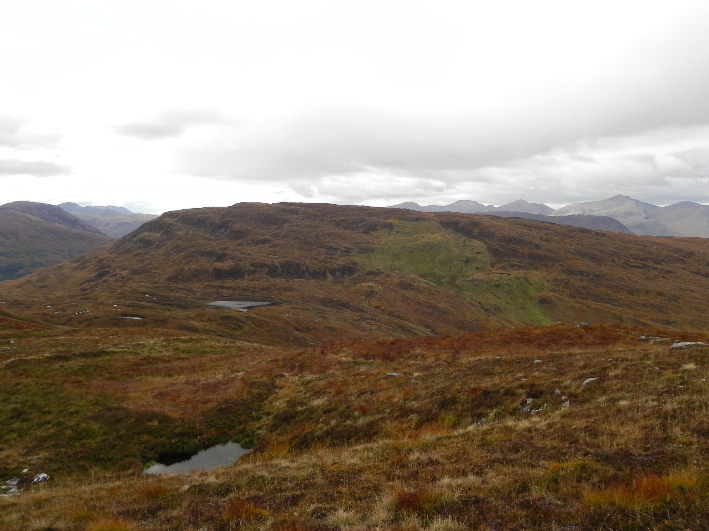 I could hear some over on Meall Tairbh, where we were headed, roaring like bulls. 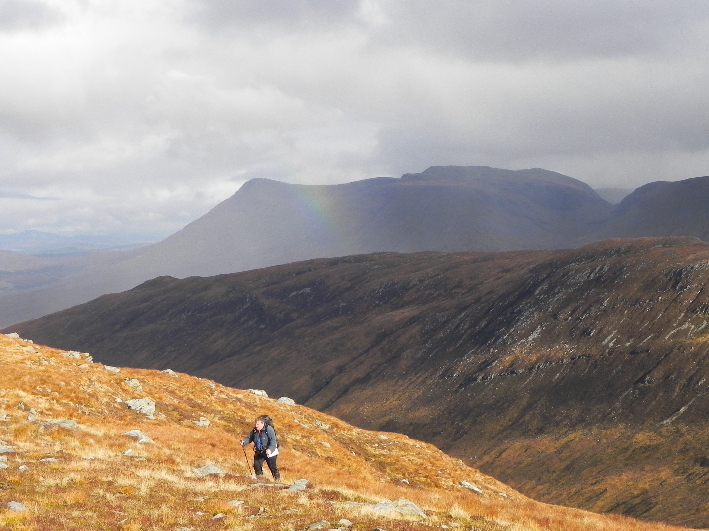 Which was a coincidence, as Meall Tairbh is the “lumpy hill of the bull”. 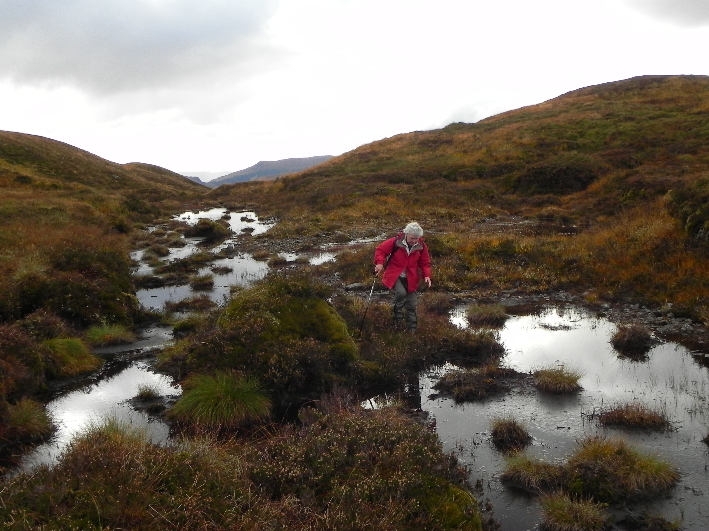 The ground between the two hills is rough and broken with bog and peat hags, as well as Lochan Coir´ Orain, a small body of water that drains off into the Allt Orain, giving rise to Inveroran. The trees lower down could perhaps explain the name, Orain being Gaelic for (amongst other things) the Ash tree. We found it hard going here, but not as hard as the climb up alongside the Allt an Tairbh to the summit, which required a few stops, despite its modest gain in height. The summit is marked by a very small cairn atop a large plate of rock, and we huddled behind it to try and gain a bit of shelter from the wind, which was bringing an advance party of raindrops heralding the impending grey cloud which was swallowing Etive Munros of Stob Coire Albannaich and Meall nan Eun as we watched. Meall Tairbh is a Graham which means no one comes here. Well, they do, but not enough to create a path of any distinction. 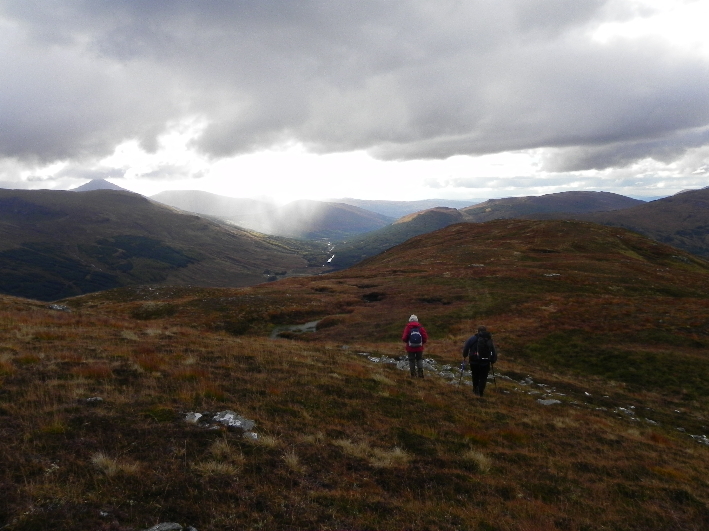 Our line of descent followed a small spur off the main ridge and into the Coir Orain. he ground was not easily traversed and the going was slow and uncomfortable. 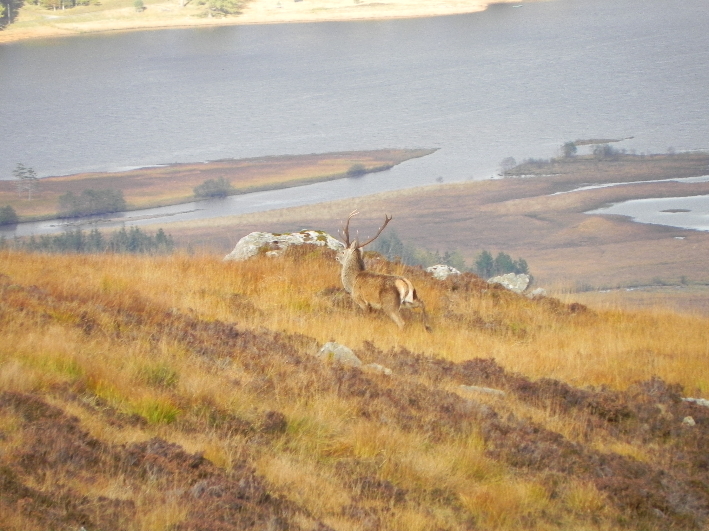 As we descended a stag ran off from nearby, and here and there I saw flattened areas of grass where the deer had lay. Onwards and downwards, and we stick to a noticeable spur of very slightly higher ground, picking up a faint path for a while before losing it as we passed through the scattered woodland on the lower part of the hill. Across the burn for a final time and I could see the Inveroran Hotel ahead. Nearby a stag was running frantically back and forth, trying to lead his charges away from us. 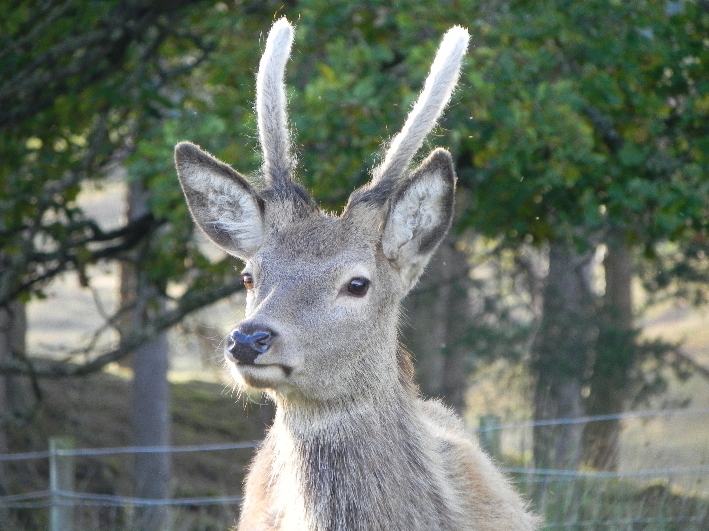 His manner was in complete contrast to the young buck who eyed us warily from the hotel grounds and posed for pictures. Last time we met near Bridge of Orchy and Inverveigh. The Inveroran pub was shut that day as well! Was on the Cobbler with a friend yesterday on a superb sunny day with spectacular views and great walking. My photos are not as good as yours but i have a misty view at 11.00 with a real clear view at 14.30 if you want to see them.